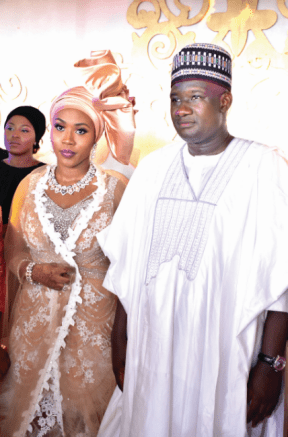 Apart from their famed humility, one thing that members of the Babangida family knows how to do better than most is hosting colourful and classy parties-and at the wedding of Halima, the second daughter of Nigeria’s Military President, General Ibrahim Badamasi Babangida (Rtd) and Auwal Abdullahi, they went a notch higher. From the Wedding Dinner which was held at the El-Amin International School, (established by the late matriarch of the family, Mrs Maryam Babangida) to the wedding fatiha and reception, held at the Babangida’s Hilltop Residence,both located in Minna, Niger State, the décor was simply amazing. As with all Muslim weddings, the high point of the celebration of love is usually the wedding fatiha which unfolded at the Babangida Family Mosque located at the General’s Hilltop residence in Minna Niger State. The short ceremony which ended with prayers was conducted by the Chief Imam of Niger State in the presence of the elders of both families. Hours before this ceremony, the venue was a beehive of activities as Nigeria’s who is who arrived for the occasion. Though the venue is just a few hours from Nigeria’s capital Abuja, many of the guests came in private jets! Halima, the second daughter of General Babangida and Auwal, a businessman who holds the traditional title of Sarkin Sudan Gombe were introduced to the whole world at the reception which was exquisitely decorated by the team from Elizabeth R with the keen supervision of the bride’s elder sister, Aisha Babangida. That reception had in attendance former President Goodluck Jonathan and wife, Patience, General Abdulsalami Abubakar and wife, Justice Fati, former First Lady, Mrs Turai Yar Adua, Senate President, Dr Abubakar Bukola Saraki, Speaker of the House of Representatives, Rt. Hon. Yakubu Dogora and so many other important personalities. What can be termed the highest point of the occasion was when the couple was invited to cut their cake, they fed each other and then took pictures with the invited guests and family members. There was so much merrymaking at this event. Guests were served special local cocktails like Kunu, Tangerine Juice, Zobo etc by well-clad waiters while food was at every one’s beck and call. The Babangida family members were at their hospitable best, little wonder that many guests went home with huge smiles on their faces.